The Vereinigte Pfeifenfabriken in Nuremberg (known in short as VPFN) was brought into being in 1901 with the amalgamation with the Gebhard Ott pipe factory founded in 1866, also in Nuremberg. 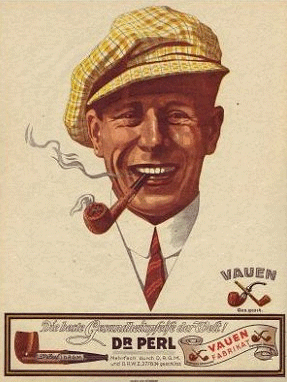 In the search for a term which would be easy for all pipe friends to remember and not confuse with anything else, Ernst Eckert's son, Adolf Eckert coined a new name for the business in 1909. VAUEN, consisting of the initial letters V (pronounced VAU) from Vereinigte Pfeifenfabriken and the N (pronounced EN) of Nuremberg. A brand name for the future had been created. Today’s further improved version Dr. Perl junior System filter plus is the best-selling 9mm activated carbon filter worldwide. VAUEN annually sells approximately 150 million filters, a notable addition to the pipe business. Since 1968 all pipe models are equipped with the Conex system. A conical shaped end of the filter chamber in the mouthpiece ensures an exact seat of the filter and hinders the smoke from passing by the filter.